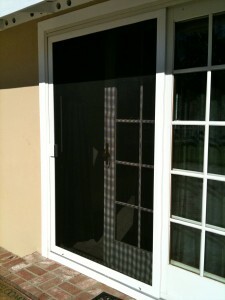 I custom make screen doors in Ojai for repair and replacement purposes. All the parts I use on my patio screen doors are metal and the hardware parts are all metal as well. However if you just need a simple re screen of a screen door or a repair I also do that and can give you a free estimate for either. I guarantee all my work and have different materials for different situations. Pet screen for dogs and cats, it acts as a guard and Aldo the invisible screen for not blocking the views. This entry was posted in Screen Doors by Marcelo. Bookmark the permalink.